As a prevalent problem within society, it is unfortunate that the feeling of loneliness is felt as such a highly humiliating condition. Thus, I chose the topic of loneliness for my fourth year thesis. Our goal is to get rid of this stigma and encourage individuals to speak up about their feelings, relationships, and difficulties. Through incentives that educate and target audiences starting from their adolescence, we can decrease the number of reports concerning loneliness, which may gradually lead to depression. This app aims to educate different views on loneliness, primarily from literature beginning in the 17th century. Through examining a curated selection of literature under the categories of companionship and solitude, we begin to develop a better understanding on how the stigma surrounding loneliness may have developed throughout history. Loneliness occurs in people of all ages. What factors contribute to loneliness during each stage of our lives? Understand that mental health can be effected starting at an early age, not just starting in our teenaged years. What did Heidegger, Kant, and Wolfe think about loneliness? How did their theories on the self influence how people dealt with obstacles that occur in their lives? 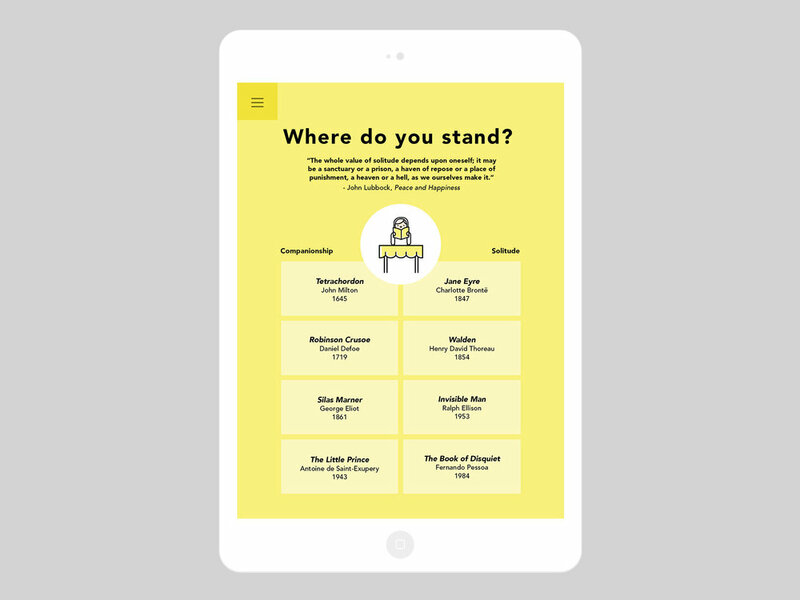 The app features eight curated pieces of literature. Once the user has completed each story, they would be given a number of recommendations from the same author. Each story within the library includes either illustrations, fun facts, videos, or all of the above to encourage interaction. Each story includes a short description as to why the story is categorized as is.